History of the Springs and Wells movement in the Malvern Hills, Part 1. Based on the paper written in 1998 for presentation at Glasgow Caledonian University. Prior to 1992 the Springs and Wells of the Malvern Hills were of minor importance in determining the tourist ethos of the locality. The Malvern Hills were well utilised for outdoor recreation. Malvern was an historic spa town with an architecture and heritage that reflected this. Hydrotherapy and its legacy of douches and doctors and the history of Malvern Priory were what local historians concentrated on. The Winter Gardens and the Abbey all added to the general ambiance of the town and visitors to the hills might climb to St Ann's Well for a tea or visit Holy Well, if they could find it, some three and a half kilometres south of the town. Since the Victorian era the Springs and Wells had been neglected apart from Schweppes who continued their long established bottling operation from a spring near Colwall. St Ann's Well building had been threatened with demolition in 1963 when the Malvern Hills Conservators voted to remove it, after failing in an attempt to pass responsibility to the Local Authority. The Local Authority similarly had not proved to be a reliable custodian of water heritage. In 1948 they had demolished the spectacular Victorian Wilson Memorial Fountain. The famous Grade II listed Holy Well building was under threat in the 1970s. Decay and apathy resulted in John Parkes, a private individual, sinking his personal resources in a last ditch effort of restoration. Further examples proliferate, all underlying a former apathy by the public. In retrospect it can be argued that much of this lay in a low public awareness of Malvern's latent water heritage. In 1992 the University of Birmingham mounted a research project that was to change the situation, although the full potential was not appreciated at the time. The Centre for Urban and Regional Studies had the previous year initiated a post-graduate tourism programme under the Directorship of Brian Wheeller with tourism development in The Malverns of particular interest. District Cllr. John Foot had called a public meeting on the 16 March 1992 to discuss Malvern tourism development. It was attended by some 300 people including representatives of the University. From this meeting it was decided to establish a Malvern Spa Tourism Association. The first meeting was on the 28 April when Tony Hocking, a local businessman, took the chair. It was joined by this author, Bruce Osborne as a member of the University, providing a link between the University's interest and the town endeavours. During the summer of 1992, Bruce Osborne, representing the University, worked with the new Association and the town's Tourism and Leisure Services Department. The University proposed and initiated the preparation of a database of tourism resources in the region. Three post-graduate researchers were awarded the project. These were Mike Bennett - social, recreation and leisure, Jane Foody - natural environment and Malvern Hills and this author Bruce Osborne - built environment and computing. The computerised database was finished and available for analysis by the late summer. Using the knowledge gained Mike Bennett went on to present a dissertation on tourism development in The Malverns. The new database proved a valuable audit of tourism facilities and prompted a number of interesting discoveries. One in particular was that the team had identified thirty-six Springs and Wells sites around the hills. The Tourism Association membership included the local historian and publisher Cora Weaver. From her observations it was apparent that the provenance and importance of these sites had been lost over time. 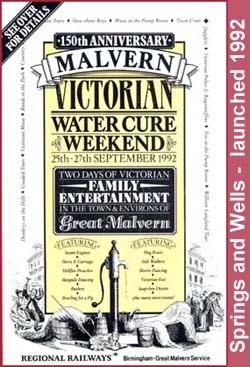 Malvern tourism development meanwhile was now active and the weekend of 25-27 September 1992 saw the mounting of the 150th Anniversary Victorian Water Cure Weekend. This was the first of a series of annual weekends providing events and attractions to bring visitors to the town. The opening ceremony for this 1992 extravaganza included a speech by the Chairman of the Local Authority, Cllr. Pat Merrick. Seizing the opportunity at short notice, a book Springs Spouts Fountains and Holy Wells of the Malverns was published in time for the celebrations by Cora Weaver and Bruce Osborne. It was based on careful analysis of the substantial University of Birmingham database of tourism resources with extensive supplementary research by the authors. It was written, hand illustrated and published locally, in time to be presented formally to the Chairman at the opening ceremony. The impact of the new book was significant in that it drew attention to an aspect of Malvern's heritage that had been lost or forgotten. Local interest was stimulated and information about further sources and sites was soon forthcoming. The new Tourism Association, through a rapidly formed Springs and Wells sub committee, extended the theme and in October 1992, Cora Weaver announced a plan to reintroduce annual well decorating. By the end of 1992 general public awareness of the Springs and Wells was increasing as is illustrated by three events. These were seen as jeopardising Malvern's Springs and Wells heritage by a newly informed public who responded appropriately. Firstly Severn Trent Water wanted to fence off areas of the Malvern Hills where spring water reservoirs existed, a proposal successfully resisted by the Conservators. Secondly, the Winter Gardens Jacob Fountain had been dry since the 1960s and this started to cause concern. Schweppes were reported as being involved in a new initiative to restore it to water. Thirdly a developer wished to enclose Lord Sandys' Spout in the garden of a newly built house. Rapid action on the part of the Springs and Wells sub committee members of the Tourism Association prevented this. One outcome was that Paul Jones the Local Authority Conservation Officer became involved with the Springs and Wells heritage for the first time as part of the rescue efforts. This was to prove significant in later years. By early 1993 the sub-committee of the Tourism Association was noticeably active and this fuelled local interest. The Civic Society, Severn Trent Water and Madresfield Estate were just some of the participants in what was becoming a community-based series of projects. This coincided with Bruce Osborne being elected chair of the Malvern Spa Tourism Association and the launch of well decorating as a major public participation project set for April 1993. The 1993 Where to go and what to see guide of Malvern quickly picked up the new interest and promoted the Springs and Wells with a four page editorial. As 1993 progressed a second Victorian Weekend was planned for 23-26 September with the Tourism Association taking a lead role. Following widespread support by local groups the weekend also included the well decorating thereby reviving the custom for local springs. The efforts of Cora Weaver, an Association Committee member, have subsequently made well decorating a regular attraction on the local calendar. By now more than 50 springs and wells sites of significance had been identified, indicating the effect of continuing research revealing the unexpected magnitude of this aspect of local heritage. Local radio took up the theme with an early morning broadcast, live from Malvern, on the 23 September. This was the first of numerous media opportunities. By 1993 the outcome of Cllr Foot's initiative was an active Tourism Association working closely with the Local Authority Tourism and Leisure Services producing major schemes to enhance visitor experience. The Bennett report from the University had set out possible further opportunities and direction. Supporting the local initiatives, the Malvern Tourism and Leisure Services Department commissioned a study of the tourism potential of the region through external consultants. Other events in 1993 included the inauguration of the first guided coach tours of the Springs and Wells conducted by this author initially and in subsequent years joined by Cora Weaver. These tours were an attraction within the 1993 Victorian Weekend and promoted through the Tourist Information Centre. Now a regular annual attraction, they have been responsible for introducing large numbers of people to the Springs and Wells and have become legendary. The programme Countryfile ran a TV documentary on Malvern Springs and Wells in 1993. There is no doubt that this was instrumental in further encouraging the practice of the public collecting spring water at local spouts. As 1993 progressed contact with the University of Birmingham was broken as this author relocated to the University of Sussex. This also led to a decline of the Malvern Spa Tourism Association, which shortly afterwards became dormant, until resurrected later as the Malvern Spa Association. Apart from occasional student short-term placement in Malvern the University of Birmingham lost contact with the tourism theme that it had been contributory in establishing. The following year saw a number of high profile events that precipitated further interest in the Springs and Wells theme. An enterprising local farmer, who also happened to be Managing Director of a brewery, started bottling Malvern Hills water from a spring on his land. Schweppes initiated litigation against Michael Hancocks challenging his right to use the designation "Malvern". This resulted in national publicity for Malvern's waters and much debate on the occurrence and nature of the many springs. The year 1994 also saw the publication of a new definitive work on the history of Malvern's Springs and Wells by Cora Weaver and Bruce Osborne. This was the culmination of extensive desk research and field work. The book was launched at the Malvern Winter Gardens and received extensive reviews including The Times, who gave full page coverage. Aquae Malvernensis contained site information on 60 celebrated Springs and Wells together with much previously unpublished historical detail. Malvern Museum supported the theme with a photograph contest inviting visitors to identify the various Springs and Wells. During the field research for the publication of Aquae Malvernensis the Owls Hole Pump was discovered near British Camp. This was in one of the few surviving water pumping stations for local spring water supplies to domestic users. Although derelict the pump was still intact. Negotiations with Severn Trent Water enabled the triple throw ram pump to be recovered and restored. Powered at first by an electric motor, it made an impressive visual display at the Winter Gardens in November at the launch of Aquae Malvernensis. The following year, 1995, saw the further expansion of public interest with the development of local lectures on Malvern's Springs and Wells. This practice has steadily developed since and is now a continuous programme of presentations to local groups within a 25 mile radius. By 1995 exploring the Springs and Wells was becoming a popular pastime for both visitors and locals. Also in 1995 the engine that once powered the Owls Hole Pump was identified in a redundant water filter station. Further negotiation with Severn Trent enabled its recovery and restoration. This was under the engineering supervision of Peter Ward of Colwall. The combined pump and engine have subsequently been used to promote Malvern's Springs and Wells at Hartlebury County Museum each year and locally where they can be seen working on selected special occasions. By now the demand for spring water fill-up points for the public was creating traffic jams at Hay Sladd, the most popular location. Potters Bar, Devon and Birmingham were just a sample of places where people came from by car to fill up with Malvern spring waters, invariably doing the return journey in a day. A breakthrough came when Earl Beauchamp's spout was the first spout to be restored to water, an event promoted in the local press. Plans were also being prepared to restore and re-water other sites but there was still insufficient momentum and finance was difficult. A further breakthrough came in 1996 when Cllr. John Ford instigated the formation of a Water Strategy Group as a voluntary body operating in conjunction with officers of the Local Authority. Cora Weaver and this author sat on this body; other active participants included Cllr. John Tretheway, Dr John Harcup, Jim Black of Severn Trent Water, Carly Tinkler, Paul Jones of the Local Authority Planning Department and Dan Leach of the Environment Health Department. By September 1996 a strategy document had been drafted for adoption by the Local Authority to pursue restoration of Malvern's historic spouts and fountains. In addition it was to promote the development of new fountains throughout the town. Additional impetus to the awareness of Malvern's Springs and Wells heritage came in 1996 with the launch of the book Aquae Britannia, again by Bruce Osborne and Cora Weaver. This contained a chapter debating the early discovery of Malvern's healing waters. In September the annual spa celebration weekend was organised again using the Victorian theme and this provided further opportunity to promote the Springs and Wells. The British Spas Federation was actively supporting local efforts alongside commercial sector organisations. Paul Jones of the Water Strategy Group was by now well advanced with plans to include many of the Springs and Wells within the local conservation areas. This was no doubt fuelled by earlier memories of the threatened Lord Sandys' spout. Ms. Carly Tinkler developed a challenging plan to establish a number of new fountains within the town area. The initial effort however was directed at an ambitious schedule of repairs and renovations to existing sites and finance was sought within the County Council H2000 scheme for Lottery funding. This bid failed and alternative sources of funding were considered. However emphasis then shifted to the town centre projects. Belle Vue Terrace was scheduled for refurbishment and this was identified as a potential site for a new water feature. Severn Trent Water undertook to provide spring water from their collector main that passes through the town. Once established this could then be feathered off to feed other town centre water features. Information on the location and provenance of Malvern's celebrated Springs and Wells was continuing to be discovered. In the spring of 1997 it was decided therefore to publish an updated edition of Springs Spouts Fountains and Holy Wells of the Malverns as a directory of all the known sites, which exceeded 60. This replaced the 1992 booklet that was substantially out of date. Contained within the 1997 publication was some speculative ideas on a proposed new water feature on Belle Vue Terrace, which in turn promoted the idea further locally. Arts Council and Local Authority funding enabled a professional sculptor, Rose Garrard, to set to work to design Malvern's first new fountain since the Jacob Fountain in the Winter Gardens in the 1930s. A process of public consultation took place during the autumn of 1997 when Rose was in residency at a shop on Belle Vue Terrace for three months. This coincided with growing concern about the future of the Jacob Fountain, following its removal from the Winter Gardens during renovation of the buildings. Belle Vue Terrace in 1998 underwent major reconstruction in readiness for the siting of the planned new water fountain. The Malvina Fountain was inaugurated later in the same year and a planned second water feature for the Millennium, both to be fed with natural water from the Hills. The Winter Gardens reopened as New Space and the Jacob Fountain saved and in situ, albeit lacking its original plinth and still dry. Other projects locally included the rewatering of the Temperance Fountain on Malvern Link and the new Hampden Fount, also at Malvern Link. The Springs and Wells tours and Well Decorating continued as regular events on the Malvern calendar. In September 1998 the dormant Malvern Spa Tourism Association was reactivated to provide a focus for development of Malvern's water heritage under the chairmanship of Cllr. John Ford. The word Tourism was dropped from the title recognising the new specialist role concentrating on water heritage. It can be seen how current reactivated interest in Malvern's springs can be traced to the 1992 audit of tourism resources carried out by the University of Birmingham. At the time there was no indication of the future value of the work. A combination of latent opportunity and from key individuals, energy and enthusiasm has resulted in Springs and Wells being recognised as a significant part of the regional tourism heritage by the millennium. There was every sign that the theme would continue to develop. In the future it was envisaged that bodies such as the Malvern Hills Conservators, the Civic Society and the Local Authority will doubtless be taking a greater role. However the lesson from the past is that such bodies merely provide a framework for the individuals with enthusiasm and drive who will continue the tradition. Already we saw that the Conservators had landscaped St Ann's Well and Earl Beauchamps spout in conjunction with the AONB Officer. Observers will confirm that Springs and Wells as a heritage theme had momentum in The Malverns and by 1999 was much valued by residents and visitors alike. This would not have happened however without the vision and enthusiasm of the many participants over the first seven years. The fact that it was the freely supplied efforts of those at the University of Birmingham that initiated the process must not go unrecorded.